Conservation Plants is a place for old and new information on developing, using, selling and enjoying all conservation plants. Check out our book selection! In 1935, after the dust storms of the Great Plains gripped the attention of the nation, the Soil Conservation Act acknowledged “the wastage of soil and moisture resources — is a menace to the national welfare.” The black clouds carrying the richest soil in the world over Washington, headed for the Atlantic, had to be stopped. From this evolved the Natural Resources Conservation Service, which included the Plant Materials Program. 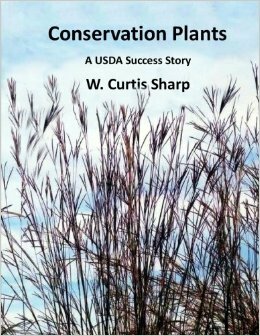 Conservation Plants, A USDA Success Story explains why such a program was needed, and who the people and the products were that made it so successful. The priorities were to stabilize millions of acres of water and wind ravaged land totally despoiled by poor farming practices, degraded rangeland by wanton overgrazing, and bleeding, unrestored mining and similar sites. How well did they do? James Smith spent the summer of 1935 around Delhart, TX, the epicenter of the Dust Bowl, collecting grass seed. He knew wind erosion. One can feel his pride years later when he wrote of a new grass quelling that wind on 500,000 acres in South Texas, thinking “There’s a half million acres that won’t blow again.” John Schwendiman and Dr. A. L. Hafenrichter can look down upon the Great Basin of the West, knowing their fingerprints are on the plants now producing forage and protecting millions of acres of rangeland. Paul Tabor and Johnny Powell certainly realized the value of their bringing a new grass to the commercial market which converted abandoned cotton fields into high quality pastures for Southeast livestock. This story documents the history, activities, and products of the Natural Resources Conservation Service, Plant Materials Program over 75 years. Decide for yourself, but we think this is a success story worth telling.